Responsible for the sale of neurological devices, disposables and capital equipment in OR and Neuro ICU. Already converted 3 neuro surgeons to Certas Plus valve to treat hydrocephalus. Completed hospital conversion to Codman at Berkshire in first quarter on the job. Responsible for identifying and training surgeons on the da Vinci surgical system. Sold to Urology, Gynecology, General Surgery, Colo-Rectal, Thoracic and Cardiac. Converted several surgeons from both open and laparoscopic techniques to robotic. Worked closely with mid to senior level hospital administration on implementing comprehensive robotic programs. Grew procedure volume 59% YOY Launched first Thoracic and General Surgery programs in Westchester. Converted several surgeons to da Vinci Single Site technology. Collaborated to help upgrade 4 hospitals to the New Si robot. Successfully launched advanced technology into all Si accounts (Vessel Sealer, Robotic Stapler, Single Site and Fluorescence Imaging). Created several multi-specialty robotic programs in Westchester. Responsible for training surgeons on the OR on the proper use and techniques when performing a Novasure endometrial ablation and the Adiana permanent sterilization procedure. 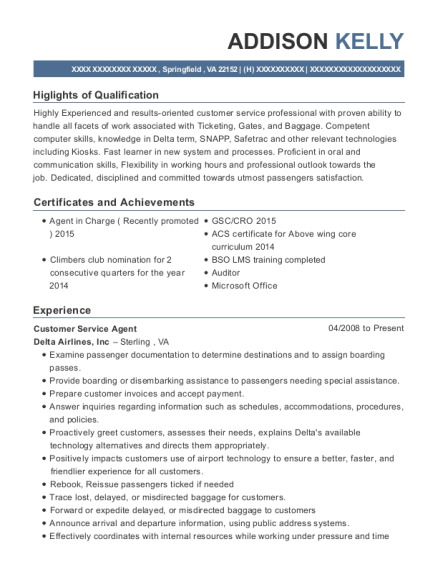 100% to quota or better every quarter to date. Increase territory sales from $610k in 2008 to $850k in 2009. Covered vacant territory for two quarters and finished over 100% in both territories (149% and 112%). Won 2008 and 2009 Quotabuster award. Closed 204 devise deal with Catholic Health System on Long Island. Successfully negotiated distribution contract between Hologic and the NYC Health and Hospital Corporation (HHC). Ranked number 9 out of140 reps in Sales Objective Ranking. Responsible for the sale of Hudson RCI/ Rusch Respiratory and Anesthesia supplies and devices to Hospitals and Surgery Centers. Leverage GPO contracts (Novation, Premier, Consorta etc.) to increase sales volume and drive compliance. at 109.14% to quota (out of 40 reps). Ranked #1 in percent to quota for Anesthesia at 133% to quota. Over 100% to quota every month in 2007. Daily interaction in the OR with Anesthesiologists, Nurses and Techs. New York Metropolitan area Responsible for the sale of medical supplies and equipment to hospitals, long term care facilities, surgery centers, hospices, physician offices, and home health agencies. 103% to quota in 2004. 116% to quota in 2005 increasing sales from $501,632 to $904,974. 2005 ranked #4 out of 25 reps for total growth in the Northeast region. 101% to quota in 2006. Increased territory sales from 450K to 1.2M in 2 years despite intense market competition. Sold and marketed Disney Channel, Toon Disney, and ABC Family Networks to cable television affiliates. Developed advertising campaigns and distributed funds for approved print, radio and television advertisements. In 2001, converted $1.8M Disney Channel subscribers from a pay to basic cable service, generating $21M annually in revenue for the company. In 2003 converted remaing $3M subscribers in New England increasing annual revenue by $36M. Organized customer appreciation events utilizing various Disney properties such as Disney theme parks, movie screenings, and Broadway plays. Worked closely with national accounts to develop customer specific contracts and proposals. Consistently surpassed yearly sales goals and objectives. Developed effective time and territory management skills that were critical in a large geographical territory with multiple priorities and 80% travel. • Responsible for identifying and training surgeons on the da Vinci surgical system. Grew procedure volume 59% YOY 2012-2013. Launched first Thoracic and General Surgery programs in Westchester. • Converted several surgeons to da Vinci Single Site technology. Successfully launched advanced technology into all Si accounts (Vessel Sealer, Robotic Stapler, Single Site and Fluorescence Imaging). Created several multi-specialty robotic programs in Westchester. As a true start up I was responsible for managing the NYC region through the allocation of resources (clinical PA and nurse), dedicated to transforming the underserved arrhythmia market through the advancement of less invasive, more efficacious ablation alternatives for cardiac arrhythmias such as atrial fibrillation (AF). Educate the market on nContact epicardial ablation devices and techniques, and explain how ablating/silencing the posterior left atrium is highly efficacious and safe for the treatment of AF. Responsible for building arrhythmia programs for the treatment of Atrial Fibrillation specifically in the persistent longstanding AF patient population. Responsible for creating collaboration between Electrophysiology, Cardiology and Cardiothoracic Surgery to build a successful program for the treatment of AF. Started 6 new Convergent procedure programs in 2015 (launched the company's first account in Manhattan at Lenox Hill). Grew YOY procedure volume by 116%. Increased revenue YOY by $350k. 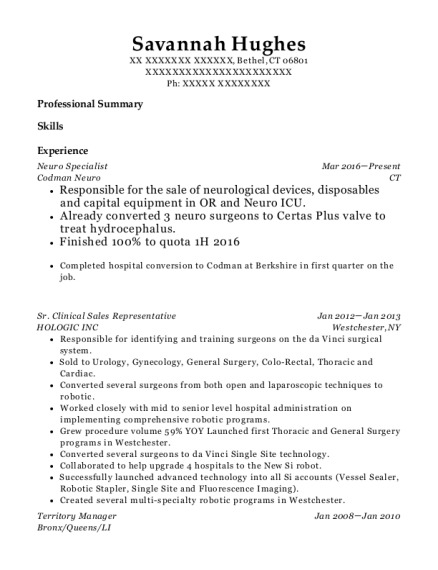 This is a resume for a Neuro Specialist in Bethel, Connecticut with experience working for such companies as Codman Neuro and HOLOGIC INC. 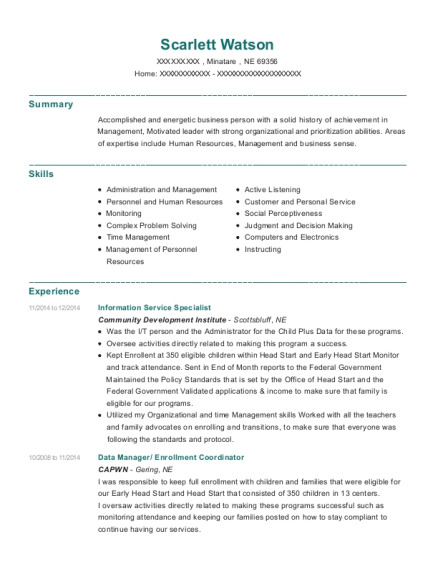 The grade for this resume is 0 and is one of hundreds of Neuro Specialist resumes available on our site for free. 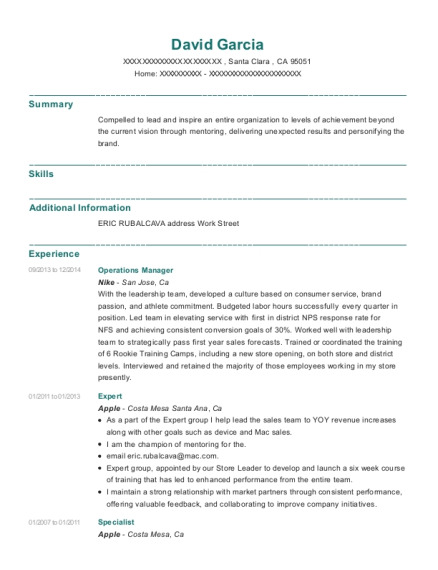 Use these resumes as templates to get help creating the best Neuro Specialist resume.